27bc : Octavian receives the title of Augustuss; birth of the Roman Empire; during the Augustan period, Vitruvius composes his famous treatise on architecture. 19bc: death of Virgil, one of the greatest poets of all time. ad14: on the death of Augustus, Tiberius becomes emperor. ad49: Jews and Christians are driven out of Rome following an edict by Claudius. ad64: Rome is devastated by a terrible fire. ad70: Titus razes fhe Temple of Jerusalem to the ground and conquers the city. ad79: the eruption of Vesuvius destroys Pompeii, Herculaneum, and Stabia; Pliny the Elder, author of Naturalis Historia, perishes in the disaster. ad96—98: Nerva introduces the principle of adoption into the imperial succession. 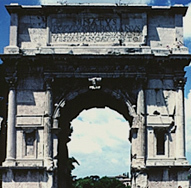 ad107: after Trajan's successful military campaigns, Dacia becomes a Roman province; Trajan's Forum is built by the architect Apollodorus of Damascus. ad122: the building of Hadrian's Wall begins in Britannia. ad193: the army of Illiria proclaims Septimus Severus, of African origin, emperor. 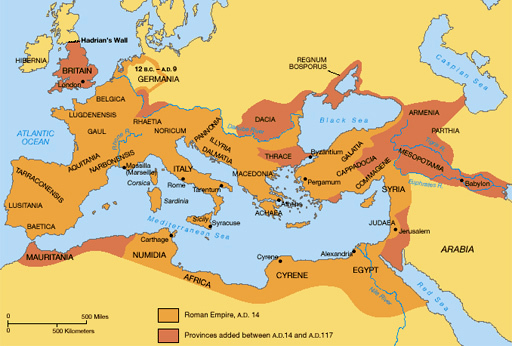 ad212: Roman citizenship is granted to all free citizens of the empire. ad248: Philip the Arab celebrates the first millennium of the foundation of Rome. ad271: on the orders of Aurelian, Rome is surrounded by protective walls. ad285-305: Diocletian institutes a system to organize the empire known as the tetrarchy. ad324-330: Constantine, having become the sole Augustus after the defeat at Maxentius, founds Constantinople. ad395: with the death of Theodosius, the empire is definitively divided into two parts by his sons. c.400bc: the wholly Celtic La Tene civilization becomes established in the region of the Middle Rhine, Champagne, and the Marne. c.300bc: the Scythians occupy part of the lowlands between the Don and the Danube. c.100BC: the Goths settle along the Baltic coasts of present-day Poland. ad64: persecutions of Christians begin. 313: Emperor Constantine, together with Licinius, issues an edict of tolerance towards the Christian religion. 432-440: construction in Rome of Basilica of Santa Maria Maggiore, the first of papal rather than imperial foundation. 476: deposition of Romulus Augustulus signals fall of the western Roman Empire. 507: Clovis, king of the Franks and founder of the Merovingian dynasty, defeats the Visigoths; Paris becomes capital of kingdom. 568: the Lombards, led by their king Audoin, settle in Italy. 614: Irish monk St Columba founds monastery of Bobbio. 726: Byzantine emperor Leo III the Isaurian condemns the cult of images. 800: Charlemagne, king of France and conqueror of the Lombards, crowned emperor of the West by Pope Leo III. 820-830: illumination of Utrecht Psalter, supreme masterpiece of Carolingian art. 1059: consecration of the baptistry of Florence, an extraordinary example of Tuscan Romanesque architecture. c.1107: the goldsmith Rainer of Huy works in Liege. 500bc: Sao culture (c.300bc-ad900) widely established around Lake Chad: in Ceylon, the cities of Anuradhapura and Polonnaruva prosper. 321—185bc: under the Maurya Dynasty, Indian Buddhism reaches its zenith. 206bc: Han Dynasty imposes its rule in China. 142bc: King Mithridates I of Parthia, of the Arsacid Dynasty, conquers Mesopotamia. c.ad200—300: in Japan, the kofun culture spreads, seen in the ancient tombs and mounds destined for members of the warrior aristocracy. 224—226: Sassanid Dynasty, under Prince Ardashir, initiates its rule over Persia. 320-550: Gupta Dynasty, founded by Chandragupta I, established in northern India. 636: Muslims conquer Syria. 645—710: during the Hakuho period, in Japan, Shinto sanctuaries are built. 732: Charles Martel's victory at Poitiers stems the Arab advance in the West. 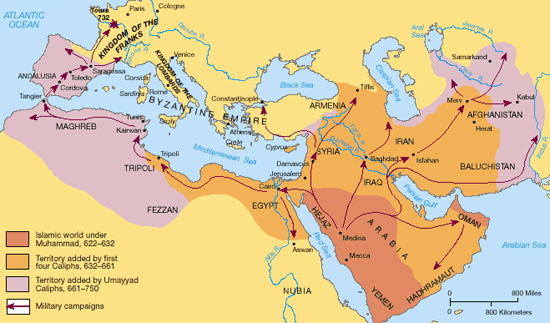 750: With the defeat of the Umayyads, the Abbasids become the new caliphs of Islam and move the heart of the empire into Mesopotamia. c.800-900: an elegant artistic culture develops in the Nigerian villages of Igbo-Ukwu. 930-1250: during the eastern Java period, Indonesian art attains great splendour. 1040: Seljuk Turks conquer Khorasan and establish their capital in Isfahan. c.1267-1276: China ruled by Kublai Khan, nephew of Genghis Khan, initiating Yuan dynasty. c.1300: an original artistic culture for the royal court develops in Benin. c.1490-1510: ivories in the Sapi-Portuguese style are produced in Sierra Leone.